Really, could you? 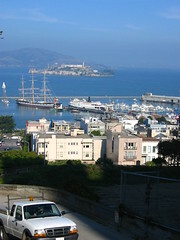 Looking across the tranquil bay, I see Alcatraz and it seems close enough to touch. Close enough to swim, too. I’ve heard there are Bay swimmers, those who forgo kayaking the Bay for a total immersion cold-water workout. While I’ve had my own frigid frolics, going walrus in Russia, it wasn’t in open water. Would you be one of these long distance cold water swimmers? One who would swim to Alcatraz? Better yet, be a Alcatraz Centurion? And if so, what do your friends and family think of your efforts? Crazy or cool? A buddy of mine used to do the Escape from Alcatraz triathlons and while I’m not capable of making the 1.4-mile swim (I’m a pretty weak swimmer), I think it’s cool when others do it. Heck, a seven-year-old from Arizona did it early this year. I can’t even remember what my greatest athletic accomplishment from first grade was. Probably making it across the jungle gym bars! My buddy said the key was to pick the right line to compensate for the strong bay current (which changes throughout the day). If you pick the wrong line, the swim can be twice as long. Back when I was in better swimming shape, I made the swim. It’s kinda tough to know exactly how much further you have to go when you’re freezing cold, and the currents pushed me to the southern end of that big break wall in aquatic park. I ended up having to swim much of the length of the break wall to finally reach the entrance of aquatic park. When I got out of the water at the finnish, I was provided with a big cup filled half full of hot coco to warm up…. I was shivering so bad from the cold, I was spilling coco all over the place. That’s what I get for not wearing a wet suit. Most people think I was crazy. I think I was crazy for not wearing a wet suit. I’m glad I did it, but I doubt I’ll do it again. Is the only purpose of your posts to link to your other posts on DC Metblogs or your personal blog? Most SF Metblog readers live here and subscribe (if I may be so bold) for events, insider observations, and off-the-beaten path info. Enough with the major tourist landmarks, already; the wide-eyed tourist thing is getting old. I have a sneaky suspicion that Wayan only references his own posts, and I was right! I wrote about swimming in Aquatic Park, which I do- at least until the weather turned 1 centrigade colder then psychologically thought it was finally “too cold”. Article on swimming in Aquatic. Whoa, Matt, you mean Metroblogging SF is only for super SF insiders – those who know the city so well that they are already Alcatraz Centurions? I didn’t notice the “locals only” sign out front. Better tell the +12,000 non-USA readers of Metroblogging SF this month that they’re not welcome either. Sorry that was the Alcatraz link. Surprised nobody wrote about the killer-sea-lion. Or was it another animal, ugh. Wayan- not that sf metblogs is locals-only, just that, like the golden gate bridge, it is written about a ton… photographed a ton… and we are a bit picky about uniqueness of view. I think we try to find a middle point; for people who have lived here awhile, show them something they may not have appreciated (with newbie eyes, perhaps) and for those that are new- let them in on some old favorites. It’s fine to write about common tourist sights, sounds, tastes, and smells, so long as you’ve done the teensiest bit of homework first. Googling, checking wikipedia, etc. I think that’s what has people so fatigued here. This post was less problematic than some other ones. Despite the kinds of comments you’re attracting, our readers are, for the most part, pretty accepting of outside views. Which is a good thing since life-long San Franciscans are tough to come by. As for the swim – I have a good friend who did one of the Alcatraz swims. She also did it without a wetsuit because, according to her, the suit just slows you down and keeps you bobbing in one place to a frustrating degree. She could never understand how I could run a marathon, but I can’t even imgaine swimming that distance in a pool, let alone in the Bay. I keep my paddling to Ocean Beach – and only during Indian Summer heatwaves. My comment was probably a bit harsh. Anna’s better matches my thoughts (but states them much more eloquently). I read Metblogs for the insiders’ view of a city. How many posts on the Washington Monument do you find on DC Metblogs? Gosh, it sure is tall! What do you guys think? Too tall or not tall enough? Oh, and I hate your favorite bar too! Too many [people outside my social/ethnic/economic peer group]! Oops, here I go on a rant again!